I have experience with roleplaying Luna, as I've been using her in past pony dreams (including my own) and I truly do enjoy it. Her personality is fun to explore through roleplay as well as expanding on it through her interactions with other ponies, building friendships and so on. There's also so much potential for some great plots in the future to put her through. My sleeping schedule is a little crazy, but I'll mostly be on during the day as I'm trying to keep a normal schedule, though there may be a rare few times I'll be up during the night. A black blotch with a white crescent moon. No pets (as of yet). Mostly Canterlot, but she does visit other places such as Ponyville on royal visits. Co-ruler of Equestria, Bringer of Night and Protector of Dreams. 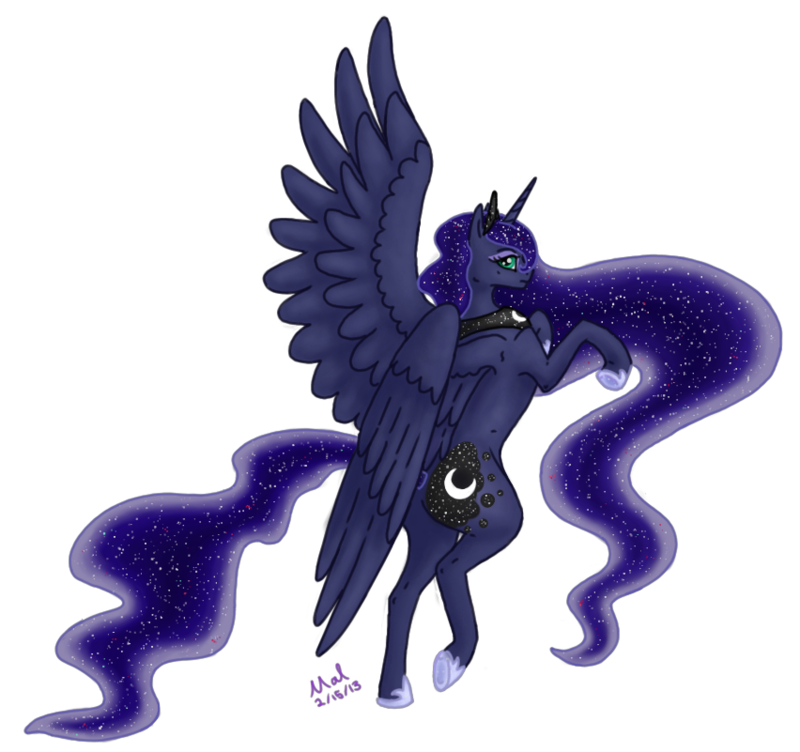 Luna is one of the ruling pony sisters of Equestria, her importance lying with her duty to bring the night and raise the moon once the day has come to an end. She may be more stern and old fashioned due to her (somewhat) recent return from her banishment, but she is steadily improving on interacting with the ponies of the present day. There is little known about the royal princesses' backstory, but what we do know about them is that they once lived within the old castle that now sits within Everfree, when it was whole. Its construction was overlooked by the sisters, with many a playful trap and hidden passageway for them to enjoy; all activated by a large organ piano. A journal was also kept within a hidden room within the library for the sisters to document their experiences and fun. At some point along the way, Luna had noticed how little ponies enjoyed her night and how much more they looked to her sister's days. Left in Celestia's shadow, Luna had grown jealous and angry, something that had lead her to confront her sister and eclipse the sun, leading to her transformation to Nightmare Moon and the later fight between the two royal sisters. With the Elements of Harmony against her, Luna was banished to the moon for a thousand years until the stars aided in her escape. After her later defeat by the mane six and the newly appeared Elements of Harmony, Luna is once again herself, on her way to understanding the new changes in that had occurred in her long absence. Luna is as dark and imposing in appearance as her sister is fair, with wide eyes of sparkling turquoise lidded with pale blue. Her coat is of a deep midnight blue, marred only by a swath of black upon both flanks, a white crescent moon contained within each. Her mane mimics the grand night sky above, a dark blue that holds an endless field of glittering stars; seeming to move in a strange fluid motion all its own. A curl of this starry hair is draped over her forehead, from which a spiral horn rises, paired with the large wings that give a part to her alicorn status. Her only jewelry, that she is never seen without, is the simple black crown that glitters just behind her horn, matched with a necklace that loops around her neck just above her winged shoulders, with naught but a simple white crescent moon to mark it. Her shoes, however, defy this dark scheme and glint a bright silvery blue. This princess does not quite share her sister's playful sense of humor and is more prone to being serious and once used to show old-fashioned mannerisms, such as using ye olde when she addressed her subjects. While previously shy and awkward when interacting with the present day ponies, due to her thousand-year banishment whittling away her social skills, Luna is steadily building them back up again. She may remain serious and rigid on occasion when it comes to her duties as one of the ruling princesses, but it doesn't change the fact that she has opened up to become much friendlier and gentler since her first appearance among the common ponies. Luna shoulders the burden of ruling Equestria beside her sister Celestia, in charge of the passing of the night as her sister takes care of the days. This is not her only duty, however, as the Princess of the Night, it is also her job to enter the dreams of sleeping ponies to help them soothe their fears and banish nightmares. Currently I do not roleplay any other alts within the dream, however I do hope to bring about my OCs: Shadow Dart, Sunset Glow, Zelenia, Bronze Shield, and Violet Jewel. The sun had finally fallen beyond the world's horizon, the death of another day lingering within the scant glint of red and orange that cling desperately to the edge of the world. It would soon be forced to fade with the rise of the silvery moon, who brought in her wake a veil of stars. Their minuscule fires come to life winking and glittering in the swath of purple darkness, finally given a chance to shine again without the sun's brilliance to put them to shame. A lone figure stands far below this celestial show, as still as a statue upon the delicate spire's marble balcony, a mere silhouette of a familiar alicorn. The last of the magic that had been gathered to set the moon on its course was seeping off of the princess's spiral horn in scant, faded-blue wisps. Her eyes were turned skyward as she lingered there, granting herself her time to admire her handiwork, her art, and above all her importance to this land. There were many other things following these thoughts, but in their painful reminders she shoved them back and finally broke her gaze from the moon's pearly glow. That was in the past, and she need not worry over it any longer. Luna finally turned her back against the night sky and open air to return to the tower's interior, taking her time to make her way down the spiraling steps until she reached the castle's many halls. The carpeted floors were lit by pools of soft light, cast by candles that glowed and flickered with dim orange flames. They were barely disturbed by her passing as she made her leisurely and aimless way through the castle. At one point her hooves had drawn her to her sister's room, where Celestia now slept peacefully within. Luna regarded the closed door with a faint smile, recalling the times they had shared. As she moved away from the door, she resolved that she would try for another day off on which they could spend together, perhaps a night on the town to have fun again. They had an eternity together, surely, but it wouldn't stop her from trying to make up for all the lost time. Very good. ^^ I approve it. Great post, Excellent grammar I approve.